However, frequent washing and exposure to wind and dust strip the skin and the hair of their natural coat of oil, making the hair frizzy and the scalp dry, itchy, and flaky. The least we can do is apply natural oils to keep them healthy. Unless you have overly sensitive skin or some other specific contraindication, regular oil massage can pamper your scalp and keep your hair lustrous. If you’re already oiling your hair and scalp with coconut oil (here’s how and why you should do just that) or similar, add the goodness of natural essential oils to it for extra benefits. Since all essential oils are highly concentrated and very potent, you should not use them directly on the scalp. Mix just a few drops in a suitable carrier oil like coconut oil or jojoba oil (which also works brilliantly for skin). You can experiment a bit with different combinations of carrier oils and essential oils. 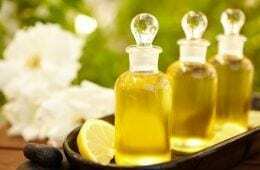 In case you have a scalp condition that precludes oiling your hair, you can still use essential oils after diluting them with floral water, vinegar or alcohol. Different essential oils have different properties; some are good for dry hair while others help remove excess greasiness. Depending on the nature of your hair and scalp, you should select the essential oils that best suit your needs. For example, dandruff is a very common problem, but some people also have an oily scalp, while extreme dryness causes dandruff in others. They need different essential oils for the same problem. Here’s a selection of the best essential oils for hair care. Find the right one for you and your gorgeous hair will be the envy of all your friends. For scalp massage, mix 8-10 drops in 2 Tbsp of warm extra virgin olive oil or coconut oil. Work it into the scalp with your fingers. Leave it on overnight to take maximum advantage of its healing and nourishing properties. You can cover your head with a towel when you sleep and wash your hair in the morning. As a bonus, lavender oil relieves stress and provides restful sleep. Rosemary oil extracted from the leaves of the culinary herb Rosmarinus officinalis has a strong minty and woody aroma. It is an invigorating oil packed full of antioxidants that help combat premature graying and thinning of hair. It encourages blood circulation in the scalp and stimulates the hair follicles. Rosemary oil has anti-dandruff action, but it is best suited for people with oily hair. It tones down the action of sebum glands and clears up clogged pores that cause acne and itchy scalp. Regular use of rosemary oil ensures healthy, strong, non-greasy hair. For a hot oil treatment, heat 3 Tbsp olive oil and add 10 drops of rosemary oil after it has cooled down a bit. Apply this hot oil to your scalp and cover it with a towel dipped in hot water. Wash off with shampoo after 30 minutes. This hot oil treatment helps the essential oil to seep into the hair follicles and lift the oil and debris clogging the pores. Do this once a week for a month to reduce greasiness, control dandruff, and promote thick hair growth. There are different types of Chamomile from which essential oils are extracted, but it is the yellow-colored Roman Chamomile oil obtained from Anthemis nobilis that is commonly used for hair care. This soothing oil has excellent anti-inflammatory properties. It can be rubbed into the scalp to relieve itchy and scaly scalp, be it from dermatitis, psoriasis or dandruff. Chamomile oil conditions the hair and protects it from the damage inflicted by environmental pollutants. When used as a conditioning rinse, it lightens the hair color and renders a golden sheen to it. Add a few drops of chamomile oil to 2 Tbsp of Jojoba oil and massage into the scalp. It provides a non-greasy protective coating that does not have to be washed away unless you’d prefer to do that. To make a hair rinse, add 10 drops of chamomile oil to a quart of water. You can use an infusion of chamomile flowers in water instead. Use it as a final rinse after washing your hair. It will leave your hair smelling mildly of apple. Extracted from the wood of Cedrus atlantica tree, the essential oil of cedar has a warm, woody aroma..It is used to treat hair loss and dandruff. It is one of the oils that have been shown to be effective in reversing alopecia areata in a long-term experimental study. Cedar oil balances the oil secretion of the sebaceous glands; hence, it is equally beneficial for a dry or an oily scalp. The warm oil improves blood circulation and stimulates the hair follicles, resulting in vigorous hair growth. Its antiseptic action helps control bacterial and fungal problems, including dandruff. For a dry and flaky scalp, mix 2-3 drops of cedar oil in 2 Tbsp of coconut oil and massage into the scalp. Leave it on for 1-2 hours and wash off. For an oily scalp, add 5 drops of cedar oil to a Tbsp of shampoo and wash your hair with it. Clary sage oil extracted from Salvia sclarea has an attractive herbal aroma. It is known for its phytoestrogen content, which could contribute to hair growth as well. It is particularly useful in preventing or reversing premature balding. When applied to the scalp, clary sage oil regulates oil production and controls dandruff. It can be used for both dry and oily scalps, but is extremely useful for dry scalp and hair. You can use it on curly and frizzy hair to make it more manageable. For dry hair, mix 10 drops of clary sage oil to 1-2 Tbsp of coconut oil and apply on the hair, brushing it in to coat every strand. It will render the hair soft and shiny. 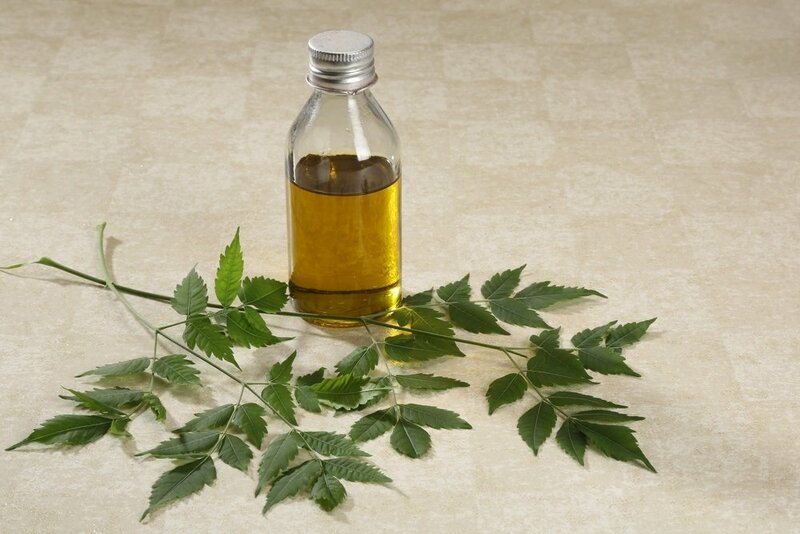 For boosting hair growth, take equal amounts of clary sage oil and jojoba oil and massage the mixture into the scalp. Wash with a mild shampoo after half an hour. Thyme oil extracted from the herb Thymus vulgaris has a strong, spicy smell, thanks to its high thymol content. Thyme oil increases the blood flow to the scalp and rejuvenates the hair follicles. This helps promote hair growth. In fact, it is usually added to shampoos and other hair care products aimed at preventing hair loss. Its excellent antimicrobial action helps resolve many scalp problems, including dandruff. However, being a strong oil, it has to be used in moderation, and preferably with other soothing essential oils like lavender. Mix 2 drops of thyme oil and 5 drops of lavender oil in 2 Tbsp extra virgin olive oil. Massage into the scalp and wash off after 15-20 minutes. This citrus flavored oil comes from the oil glands on lemon rinds. It is a drying and clarifying oil ideal for an oily scalp. If you have dandruff or scalp acne along with oily hair, lemon oil can help. It is antiseptic and antimicrobial, helping to resolve secondary infections that often complicate acne and dandruff. For combating an oily scalp and dandruff, mix 5-6 drops of lemon oil with 2 Tbsp jojoba oil and rub into the scalp. Wash it off with a mild herbal shampoo after an hour or two. To remove excess oil from hair, use lemon oil in warm water as a rinse after washing your hair. Rinse again in plain water. Peppermint oil has a cooling effect we are all familiar with. When applied on the skin, it improves blood flow to the area. This property is very useful for rejuvenating hair follicles and promoting hair growth. Its cleansing action opens up clogged pores and encourages normal flow of skin oils, making it ideal for people with dry scalp. It also helps control dandruff associated with dry skin. Mix 5 drops each of peppermint oil and lavender oil in 2 Tbsp warm coconut oil. Apply to your scalp and leave it on for 15-20 minutes. Wash off with shampoo. Although peppermint oil is cooling, it can cause skin irritation, especially in people who have an adverse reaction to mint-family plants. Test on a small area of skin before applying on your scalp. Patchouli oil is obtained from the flowers and leaves of Pogostemon cablin, a plant related to mint. Its strong, musky smell can be quite overpowering if used in large amounts, but it improves over time. Patchouli leaves were traditionally used for skin and hair care in many Asian countries. Its anti-inflammatory and antiseptic properties make it excellent for treating many skin and scalp problems. 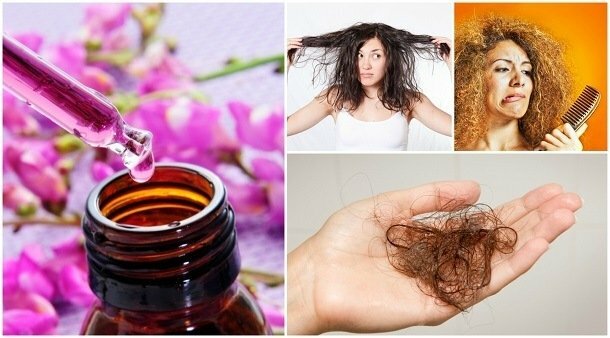 People with eczema, dandruff and dermatitis can greatly benefit from this essential oil because these problems are often the underlying causes of hair loss. Mix 2-3 drops of patchouli oil and 5-6 drops of rosemary oil in 2 Tbsp of argan oil which complements the anti-dandruff and anti-acne action of patchouli oil. Massage the mixture into the scalp and leave it on for an hour or two. Wash off with shampoo. Use a lemon or lavender oil rinse if you want to mask the smell of patchouli. Tea tree oil extracted from the Australian tree Melaleuca alternifolia has been popularly used to treat almost any skin and hair problem. It is considered the number one remedy for dandruff. It moisturizes the scalp and relieves dryness and itching. Tea tree oil works deep into the hair follicles, unclogging them and helping with normal flow of the skin oils. It is also known for its antimicrobial action, which helps resolve fungal infections as well as scalp acne complicated by secondary bacterial growths. For promoting hair growth, mix 2-3 drops of tea tree oil to 1-2 Tbsp sweet almond oil or coconut oil. Since this essential oil is very strong, the carrier oil should be first applied on the scalp before the oil mixture is used. Wash off after 15-20 minutes. For dandruff and acne control, add 4-5 drops to 1 Tbsp of shampoo and use it to wash your hair. Vetiver oil is a sweet-smelling oil with a cooling effect. It is extracted from the aromatic roots of a grass called Chrysopogon zizanioides. It helps reduce hair loss resulting from excessive heat in the body. High-stress levels also may cause premature balding and graying. The calming and soothing effect of vetiver oil cools the mind and body, reducing stress. It has excellent antioxidant action to prevent premature aging of hair follicles due to free radical damage. Mix 5-6 drops of vetiver oil in 2 Tbsp warm almond oil and massage into the scalp. Wash off after 2 hours if you prefer, but you can leave it overnight too, using a towel to or cap to cover the head. For hot oil treatment, warm 2 Tbsp of olive oil or coconut oil and add 5 drops of ylang-ylang oil. Apply it to the scalp and cover the head with a towel dipped in warm water. The warm, moist atmosphere created inside the wet towel helps the essential oil to penetrate deep into the skin glands and rejuvenate them. Wash your hair after an hour. You can add a few drops of this fragrant essential oil to the final rinse too. Unfortunately it has become possible for almost anyone to start selling “essential oils” (even if the quality comes nowhere close to being classified as an “essential” oil) and that means it is quite a minefield to navigate the market and find the real suppliers of high quality essential oils. Note: It is always best to try a tiny bit of essential oil on your skin (mixed in a carrier oil) before using. Most people do not have a reaction, but it is always good to know before using it on your scalp and hair.